With Przelewy24, you can accept payments in any of forty six payment methods, five languages, and Polish Zloty currency (PLN). 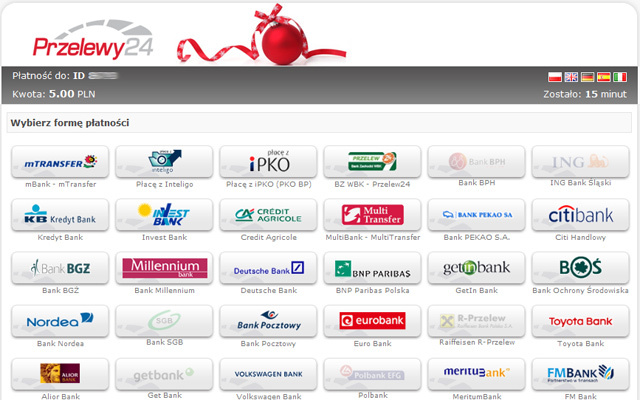 And now, you can start accepting payments via Przelewy24 with your ClassiPress, JobRoller, Vantage, HireBee and Clipper website. Accept payments using methods like: mBank, PKO, PayPal, Moneybookers, Credit Cards and much more. Allow customers to view their checkout form in any of 5 different languages. 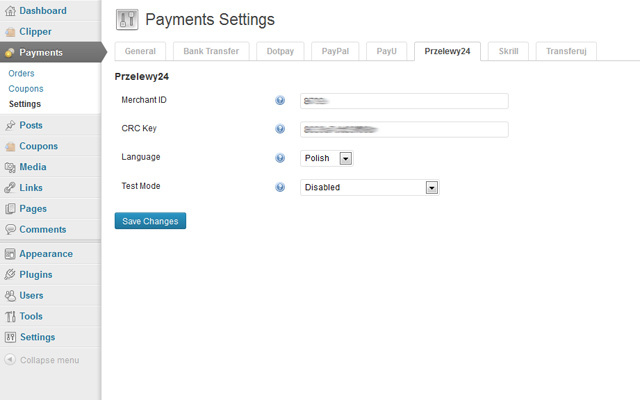 Test Mode – Allows you to test payments processing before goes live. Sandbox Account required. Secure – all form data are signed and verified each time gateway communicate with payment provider. Support PDT/IPN (payment data transfer/instant payment notifications) – When customer back to site after transaction, payment is verified by PDT. If customer closed browser after transaction or payment was not immediatelly processed, payment processor will communicate with gateway by using IPN and hidden channel. 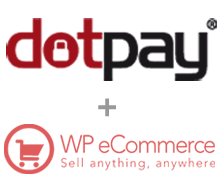 AppThemes product with Payments Support. 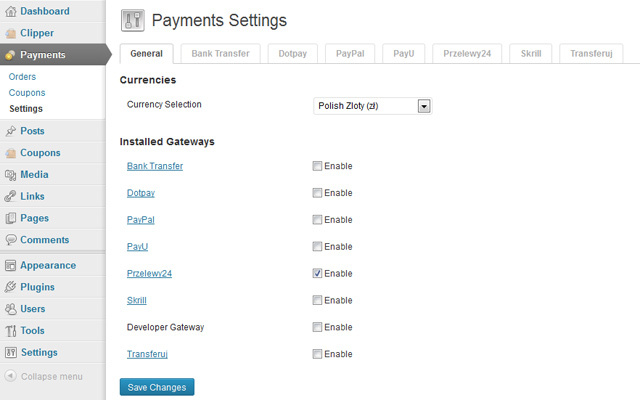 The Przelewy24.pl Payment Gateway will work with any theme that supports AppThemes Payments. To install, simply upload the plugin via the WordPress Administrator Panel. Or extract the plugin’s files and manually upload via FTP. Once activated, you can configure the settings via the Payments Settings for your site. Note: This plugin will automatically error and deactivate itself if the current theme is not supported. Simply reactivate the plugin through the Manage Plugins page once a support theme has been selected. I just want to know can i use this plugin for accepting payments form india my bank account is in india, please Help, paypal do not support domestic payments from india. I want to purchase https://marketplace.appthemes.com/plugins/coupons-tagger/ this plugin for my under developing coupons WordPress site. Can i use this plugin Without Clipper Theme individually. As my designer develop as HTML Theme and i integrated it with WordPress now i need https://marketplace.appthemes.com/plugins/coupons-tagger/ plugin to buy and use it with my custom theme . let me know any possible way, i desperately want to buy this plugin to use, please help me !! No, sorry, “Coupons Tagger” plugin will not work with other theme, will work only with Clipper, it is using functions and classes that comes with the theme, without them, it will simply error. thanks a lot for quick response !! Jump start your Clipper site with affiliate deals from iCodes India. Jumpstart your Clipper site with affiliate deals from ShareASale.